For nearly a century after Hadley's founding in 1659, its residents huddled within a protective stockade. This house was the first to stand boldly outside the town center. The central hall of the main house. Built in 1752 by Moses and Elizabeth Porter on a tract of land known as "Forty Acres and its skirts," its layout was innovative and up-to-date for its time, featuring a central hall while most houses in western Massachusetts were still built around a central chimney. The family undertook a series of renovations in the late 18th century to make the productive spaces such as the kitchen and dairies bigger, and to create more privacy by separating the family's rooms from those used by the servants and slaves. The federal-style arch in the long room. The last changes were completed by 1800, and also kept the house stylish. The elegant arch in the long room is a feature that the family particularly loved. The house has changed very little since then. From about 1879 the house served as a summer home; in 1949, it became the historic house museum you see today. The house stands as a good example of a wealthy family's home in the late eighteenth century, and affords us a wealth of information regarding the lives of families like this and what domestic life might have been like for their servants and slaves. The house that Moses Porter built in 1752 was an amalgam of architectural styles. He blended aspects of Georgian architecture with earlier regional styles to create a unique, though relatively ephemeral – the house had been significantly altered by 1799 – monument. Moses perpetuated the architectural tradition of the second-floor overhang that had characterized his family’s homestead in the center of Hadley (which still stands as the oldest house in town), built by his grandfather Samuel Porter, Jr. in 1713. When Samuel’s house was built, it most certainly stood out from the other houses around; so too did Moses’. While Moses employed the traditional overhang, he sided his house with boards scored and painted to look like Longmeadow sandstone. This Georgian effect, called rustication, was not at all popular in the Connecticut River Valley. In the eighteenth century, some upper class families in urban areas built houses with rusticated facades, and some civic buildings displayed it as well, but in Hadley it was unheard of: the rustication combined with the overhang produced a thoroughly distinctive dwelling. The Porter-Phelps-Huntington house, as we see it today, is quite different from the structure originally built by Moses Porter. Inside, the central hallway illustrates another departure from the traditional architecture of Hadley, including the 1713 Porter house. Central hall plans were more characteristic of Georgian style houses, which were coming into fashion around the time that Moses was building his home in the middle of the eighteenth century. But Moses’s house was not a Georgian house: while rustication was a feature of Georgian houses, Moses did not incorporate Georgian decorative elements on the interior, such as joined and paned wooden paneling lining the rooms. Instead, Moses kept the traditional bare feather-edged pine paneling in each room. So, although incorporating novel, fashionable architectural and decorative styles into his new home, he preserved his connection to the Valley via the retention of many traditional aspects of Connecticut Valley houses. 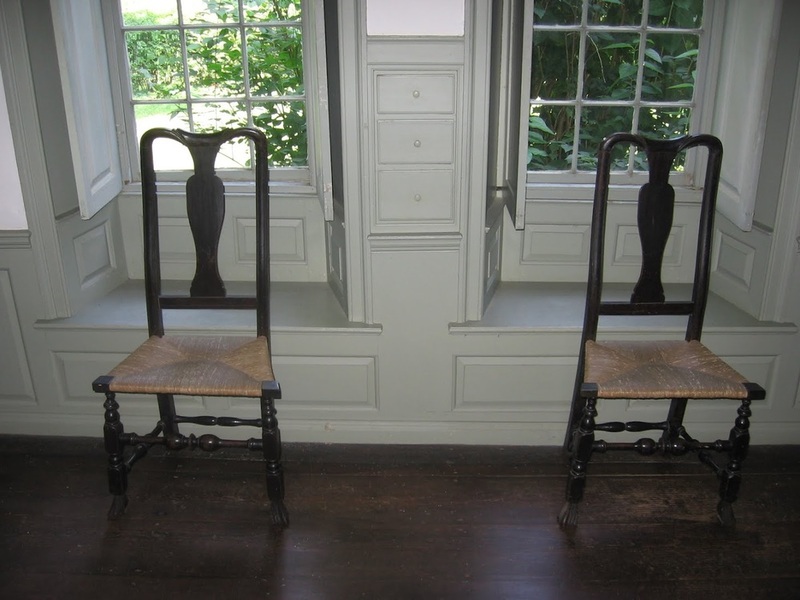 Charles Phelps purchased the above chairs from Samuel Gaylord, Jr., a local joiner. After Charles Phelps took control of the house at Forty Acres following his marriage to Moses and Elizabeth Pitkin Porter’s only child Elizabeth, the Georgian style came to replace much of the traditional interior. 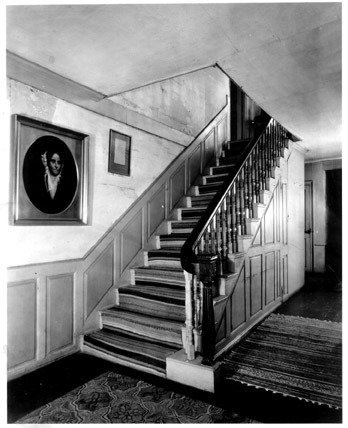 Charles hired local joiner Samuel Gaylord, Jr. to remodel many of the rooms in the house in 1775 and 1786. In addition to adding joined wainscoting in some of the rooms and the central hallway, Charles also purchased six side chairs from Gaylord. Two of them survive in the house to this day (see right). Although Moses’ house was revamped into a much more Georgian edifice by Charles Phelps, this too proved ephemeral; by 1800 much of the house had been remodeled again (inside and outside) in the new Federal style. The survival of some Georgian elements in certain rooms attests to the evolution from an eclectic blend of traditional and trendy Georgian to a house that has become, by and large, Federal. 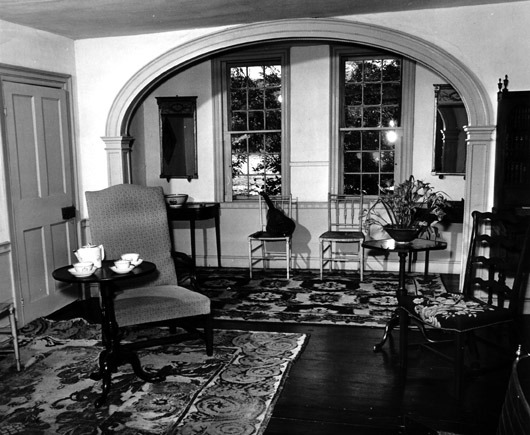 One of the chairs described below against paneling installed by Gaylord in 1775 in the Long Room. The Great River: Art & Society of the Connecticut River Valley, 1635-1820 (Hartford: Meridan-Stinehour Press, 1985). Zea, Philip, “Rural Craftsmen and Design” in Brock, Jobe and Kaye, Myrna, New England Furniture: The Colonial Era (Boston: Houghton Mifflin, 1984), p. 65-67.